The Czar is one of the few Hookahs that can be considered a true piece of art. 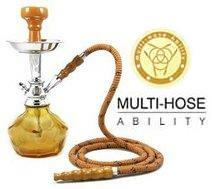 This Hookah consists of a high quality detailed solid steel shaft, symbolic of Medieval Times. The Czar also contains a glass vase that is considered to be one of the most durable and thickest style vases on the market. The Czar may be used for both decorative and smoking pleasures, providing entertainment for years to come. 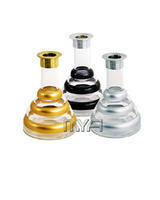 The Czar may be converted to a four hose Hookah by utilizing stem adapters that contain the auto-seal system. The Auto Seal system eliminates the need to use rubber stoppers and flip caps when there are multiple users smoking the Hookah. This Hookah may be used for both decorative and smoking pleasures, providing entertainment for years to come.